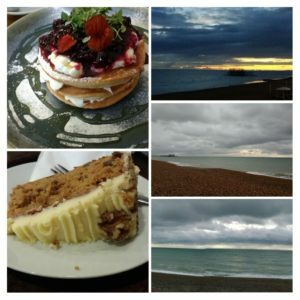 A quick recap and Brighton round 2! Last week I was home too late on Tuesday to make it out to the club run in time, so I had a run on my own- usually this would be fine (and I wore my light for the first time- which meant getting ready took ages as I could not remember which way around the straps went)- but it was also Halloween so I was basically dodging kids (and teenagers who were way too old) all dressed up for most of the run – it made it hard work! There were so many houses decorated too- with that fake spider web stuff and the do not cross crime scene tape. I’m not a Halloween fan, but at least the trick or treaters seem to only go to the decorated houses now which seems better. Happy once I had finally worked out how to put it on! 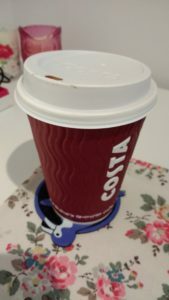 Yoga was cancelled for the first week back, and so I took the opportunity to head into town after work to pick up a free drink from Costa (not my coffee shop of choice, but the Three mobile app had another freebie so not being one to look a gift horse in the mouth I went for it). It seems that all the shops had had a Christmas explosion (and some houses too-why??? ?- I love Christmas but just for December please!). 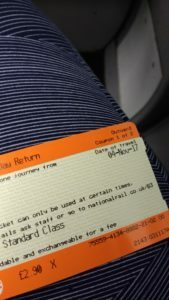 On Thursday I had a nice 4 mile run, and then on Friday evening we got the train down to Brighton. 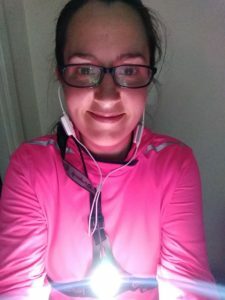 We went a few weeks ago for the 10 mile race, but the restaurant we had booked had a power cut, so we decided to go down again. As we were staying right by the station, on Saturday morning I got the train across to Hove, to run Brighton and Hove parkrun. I’ll do a separate post about that as it was a new-to-me course. On the train on the way back I messaged Andy, who was in Cafe Coho, so he ordered breakfast. By the time I sat down the cup of tea was already there, and it didn’t take long for the pancakes to arrive. 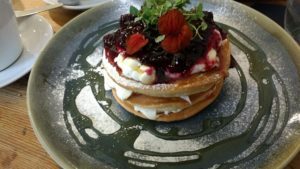 Their pancakes are so good- they come with Greek yoghurt, berries and honey. 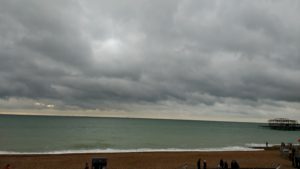 After going back to the hotel for a shower, we had a lovely walk along the seafront towards Hove. It was a bit rainy (it had rained hard on the final lap of the parkrun course) but luckily that didn’t last too long. There were some huge waves and dramatic clouds (and some people on the beaches getting very close to the waves…). We wandered back to town and around the shops for a bit, and of course had to stop and get some cake. The place we had been to a few times (Catwalk cakes) has closed, so we found another cafe (there is no shortage of cafes- you just need to find one with a seat! ), and enjoyed sharing a slice of carrot cake. After more of a walk (the sun sets so early now- that top right picture was at around 5pm) we headed to Food for Friends- thankfully no power cut this time! After dinner we got the train back home, catching up on the film podcast and watching lots of fireworks. 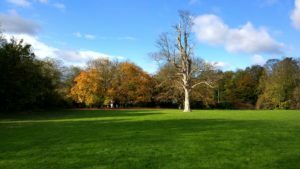 On Sunday I had a short-ish run (for a Sunday- 6 miles) in the most beautiful autumnal weather. We then headed into St Albans for breakfast, as we had to be there later for a family baptism, and wandered around the park (we even found the house that was on Grand Designs recently). This week has gone by in a flash- I missed the club run on Tuesday as I had an awful headache. I’d taken painkillers but after a 2 hour meeting and driving home it still hadn’t gone, so a short walk in the fresh air had to suffice. Yoga was back on Wednesday (hooray! )- we did a lot of work on hips including some partner squats- I need to remember these things for when I get back from a run as I do try to do some of them as stretches now. On Thursday I picked Mum and Dad up from Heathrow as they had been in China. I was really not looking forward to the M25 at rush hour, or navigating around the airport, so I was very pleased with myself when I managed it (I was telling myself “you are a thirty-something year old person, you should be able to drive to an airport…” but these things make me anxious still). Anyway it was lovely to find out how their holiday had been. And here we are at Friday! I don’t think I’ve been up to date with this blog since the summer! Any plans for the weekend? Are people near you going Halloween crazy? Or have you seen any Christmas decorations? Which towns/places do you like to visit over and over? 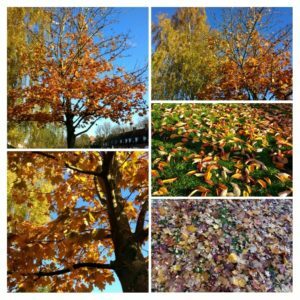 Author Maria RunsPosted on November 10, 2017 Categories General ramblings, Running, Stuff I love! I wholly agree about Halloween. Such an annoying time of year. But then I guess it provides parents with something fun to do with their kids (though I hate it when teenagers go out and in mobs, like you said). Oooh enjoy! I love Cafe Coho (there is one in the lanes too, near Fat Face, but the station one is quieter I think). Previous Previous post: A long run, and afternoon tea to recover!